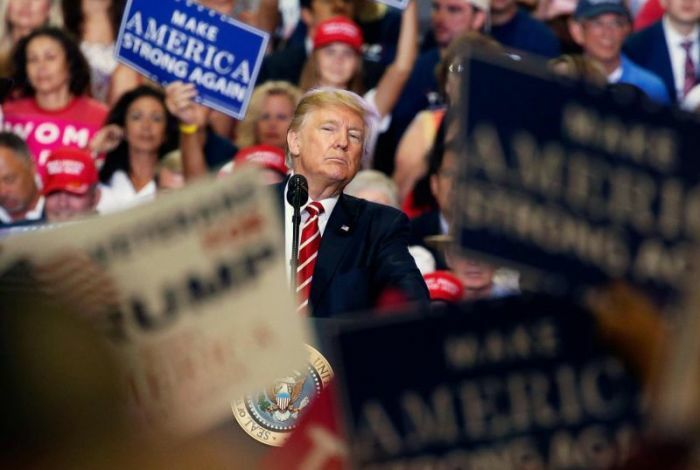 WASHINGTON — Three out of 10 white evangelical Protestants in the United States say "there's almost nothing President Trump could do to lose my approval," a new survey from the nonpartisan Public Religion Research Institute has discovered. As exit polls from last November found that about 81 percent of self-identified white evangelicals voted for the billionaire real estate mogul, the religious demographic has been criticized by mainstream pundits and commentators for being one of Trump's strongest and most important political bases despite Trump's character flaws and immoral behavior. On Tuesday, PRRI released its annual American Values Survey titled "One Nation, Divided, Under Trump," which found that just over four in 10 white evangelicals (42 percent) were weak Trump supporters, answering that although they support Trump, it is still possible for them to lose their support. Meanwhile, 30 percent of white evangelicals say they approve of Trump and "there's almost nothing President Trump could do to lose my approval,"
Eleven percent of white evangelicals were "weak" Trump opponents, saying that their opinion of Trump could still change. However, 13 percent of white evangelicals were "strong" in their opposition to Trump, answering that there is almost nothing the president could do to win their approval. By comparison, a total 34 percent of all Republicans polled were "strong" Trump supporters and 50 percent of Republican respondents were "weak" supporters. Only a total of 12 percent of Republicans were weak or strong Trump opponents, suggesting that white evangelical Protestants are about twice as likely to oppose Trump than the average Republican. However, the data on white evangelical protestants also includes responses from non-Republican evangelicals. The survey also found that 72 percent of white evangelicals approve of Trump's job performance through the first year of his presidency while 84 percent of Republicans as a whole favor Trump's job performance. "What struck me is that Trump supposedly got 81 percent of the white evangelical vote and he now has 72 percent approval, which means that white evangelicals are still tracking roughly what they voted," Henry Olsen, a senior fellow at the Ethics and Public Policy Center, told The Christian Post in an interview after participating in a panel discussion about the newly released survey at the Brookings Institution. "That suggests to me that if you looked at the Trump-backers among white evangelicals that he would have closer to 40 or 45 percent of "strong" support. ... I don't have historical data to fall back on ... but that would make sense in the sense that there are people even among supporters of Trump [that recognize] that there is something that they are not 100 percent on [about Trump]. [Maybe] his behavior causes them to pull back." White mainline Protestants were split with 49 percent approving of Trump's performance and 49 percent disapproving. As for white Catholics, 49 percent approve and 47 percent disapprove. The PRRI research also found that white evangelical Republicans were more likely than average non-white evangelical Protestant Republicans to prefer Trump to some other GOP nominee in the 2020 presidential election. While 68 percent of white evangelical Republicans said they prefer Trump over "someone else" in the 2020 GOP race, 63 percent of average Republicans and 56 percent of Republicans who are not evangelical, said the same. Twenty-five percent of white evangelical Protestant Republicans prefer another candidate to be the Republican nominee in three years, while 37 percent of non-white evangelicals said they also prefer "someone else." On average, 31 percent of Republican respondents said they prefer a candidate in 2020 other than Trump. When examining these numbers, Olsen said that one thing to keep in mind is that the PRRI data shows that the majority of both Democrats and Republicans thinks that the other political party is "so misguided they pose a threat to the the country." "There certainly was a lot of people voting for Trump because they couldn't vote for HIllary. The exit polls made it clear that more people liked Hillary than like Trump but the reason why Trump won is because he won more of the people who didn't like both of them. He won them by almost 20 percent. A lot of those are those who tend to be Republican who don't like Trump," Olsen, the only Republican on the panel and the author of the upcoming book The Working Class Republican: Ronald Reagan and the Return of Blue Collar Conservatism, told CP. "That's something that gets overlooked almost all the time," Olsen added. "You can take a look at this data and see that 41 percent of the people like Trump. Well, that is actually higher than when he won the presidency. So, if the same number of people don't like a hypothetical Democrat and don't like a hypothetical Trump but would still break for him by 20 points, he wins re-election even though more people don't like him. That's what people are overlooking. It's not just about Trump. It's about choices." Joy Reid, a liberal MSNBC talk show host, listed a number of reasons during the panel in which conservative religious voters would support Trump. She touched on the conflict on religious liberty in the aftermath of the Supreme Court's decision on marriage to which Trump vowed to protect religious freedom. Reid also touched on the other desires of evangelical conservatives, such as having the United States embassy in Israel moved to Jerusalem, advancing pro-life policies and nominating conservative judges. "Christians see Donald Trump as a figure that, while he may be personally heretical, is carrying the Gospel into public policy because he is putting judges in who will protect Christian cake bakers; who will, in this tax bill, sign a piece of legislation that will drop the federal prohibition against churches getting directly involved in politics; whose tax policies will favor people who educate their children in homeschools and in private schools and disproportionately disfavor public schools, which a lot of these Republican voters also think [public schools] are [indoctrinating] children with liberal and almost communistic values." Does the Support for the Presidency of Donald Trump Hinder Efforts of Racial Reconciliation?